With the help of donors like you, access to safe water, sanitation and hygiene will be provided for nearly 30,000 children and families. 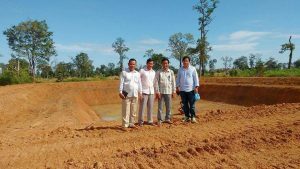 Our new program in in the Svay Leu district of Cambodia launched last summer and we’re beginning to see success in the villages where we serve. The first Healthy Homes were certified in November and to date, more than 180 households have received a Healthy Homes certification. A family is certified when they’ve successfully accomplished the goals of using safe water and storing it safely, using a latrine, washing hands, drying dishes safely and keeping a clean compound. With an average household of five, that means together we’ve impacted nearly 1,000 people in desperate need of clean water. 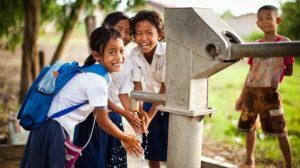 Throughout most of Cambodia, water is plentiful, but it’s not always clean–particularly in remote regions. In Svay Leu, locals collect fresh water with rain jars during the rainy season. During the dry season, they get their water from man-made ponds and unprotected springs–water that needs to be filtered before use. As part of our efforts to provide a reliable source of water, our teams have constructed three new ponds where villagers can collect water for washing, latrines and drinking, once filtered with their household ceramic filter. Please pray for our in-country field staff as we continue to build the infrastructure that will help us reach the people of rural Cambodia with water, sanitation and the good news of God’s love.